Borrowed, as most things in a man’s wardrobe from military uniforms, the Pompom (18th C french word bombe is a hat decoration of a knot of ribbons) adorned soldiers hats as a way of differentiating regiments on the battlefield. Fast forward to the late 1960”s when one of the first manufactured boy bands The Monkees was created as the American answer to the Beatles and the stylist chose a Bobble Hat as musician Mike Nesmith’s ‘thing’. The very British bobble hat was at the time a casual and classless accessory for fashionable young men who wished to seem anti-fashion. At the Tailor Retailored our new cashmere Bobble Hats are neither fashion nor anti-fashion but the ultimate in cool, luxurious cold weather head gear. Why Is Cashmere more expensive than other kinds of wool? - It all comes down to the goats. For the uninitiated: cashmere is the finest textile fibre on the planet. Thanks to Capra hircus laniger (cashmere goat) we are warmer and softer all winter long. Cashmere goats are raised over central Asia but don’t let their rough-looking, shaggy styling fool you - it’s the downy, short hair close to the skin that makes for fine cashmere. Nineteen microns is where cashmere becomes cashmere. Anything more should be ignored and doesn't warrant investment. But the lesson doesn't end with fibre thickness! The fineness of a cashmere item comes downs to process (up to 30 in our case) - the collection of the raw fibre, the spinning of the yarn, the knitting and construction and finally the finishing all affects the look, feel, and touch of the garment. When British Army Major General James Brudenell, the 7th Earl of Cardigan, led his men into battle during the Crimean war, I doubt he envisaged a garment bearing his name worn by every man from the age of five to 95. The cardigan has come a long way since the 1850’s it's managed to surpass the term ‘trend’ and enter the wonderful world of the ‘staple’, becoming an essential part of every man’s wardrobe. A go to piece for winter and summer wardrobes it transcends not only the seasons but the boundaries of both smart and casual. This dual ethos means the cardigan can be worn with a suit and tie but can look just as stylish worn with either a smart polo shirt or a plain t-shirt. Set to be one of the key colours of the coming season, grey makes perfect sense as the days shorten and the temperatures starts to fall. Soften it - Team greys with a pastel like pale blue or pink for a modern, carefree attitude. Add a pop- Grey creates a flat, neutral background so it works really well as a grounding for vibrant pops of pattern and colour. Layer it up - Wearing differing shades of grey add a richness and three-dimensional quality to what is sometimes considered a rather flat colour. Add pattern - As grey is a rather subdued colour, it 's a great counterpoint for checks and prints - but keep it real. Nothing says the onset of autumn quite like the appearance of the roll neck sweater. Easy, elegant, super comfortable and so so easy to dress up and down, this simple piece of knitwear will arguably be destined to be one of hardest workers in your A/W wardrobe. Choose from thin or thick gauges and use in place of a shirt under a suit for a debonair take on tailoring or team with a simple pair of well-cut trousers and trainers for a down time look that's uber luxe. Be brave, its a perfect style statement to wear to work, properly fitted, it’s both slimming and lengthening - the extra neck fabric forces you to keep your head up whilst holding your stomach in! The French concept of ‘La Rentree’ - the return to normality after the summer holidays and festival fun, has us at The Tailor Retailored pondering the return to layered dressing as we enter the Autumn months. Our Essential range of expertly cut sweaters knitted in the most luxurious cashmere yarn make the transition so much easier. Royalty, aristocrats, dictators have long embroidered their initials and symbols on their clothing- the fleur de lys, Prince of Wales feathers, Napoleonic bees, but when college students started to initial their shirts to avoid confusion at the laundry the monogram entered the lexicon of prep. While some may find this a little flash, here at the Tailor Retailored we think that a little personalisation is one of the few ways a man can make a sweater truly his own. The enduring and beloved Ivy League down time style of the Kennedy clan is as modern and seductive today as when it was first photographed on the family holidaying in Hyannis Port. Pharrell Williams takes a dressier preppy approach, often pairing shorts and cashmere cardigans with shirts and ties. Late summer boating requires the practicality of deck shoes, the ease of well loved Bermuda shorts and the cosy elegance of a cashmere crew neck. Here at The Tailor Retailored we're advising the perfect outfit for low key glamour at an end of summer cocktail party is a pair of trim white shorts, our Eoin crew neck in Navy and naturally - a tan! Your skin is a sensitive organ, the first part of our body to drop clues that we should be treating it with more care. Skin reacts to what we wear against it; a coarse sheep’s wool jumper can bring on that uncomfortable itch as you pull it over your head. Unlike wool, cashmere offers a scratch-free experience. Thanks to its super-fine fibre density, cashmere lacks the rough, scratchy texture associated with wool. Cashmere is celebrated for its superb insulation, outperforming wool by far. In fact, The Tailor Retailored cashmere yarn is up to eight times warmer than regular sheep’s wool. Cashmere’s ability to retain such high levels of body warmth is due to the unique structure of its fibres. Cashmere fibre’s very fine structure enable it to trap more of air particles, which in turn heat up to provide superb insulation That’s why the Cashmere goat isn't phased by their habitat’s extreme temperature fluctuations from day to night! Quality cashmere has the added benefit of not shrinking when washed, unlike a lot of sheep’s wool. Provided you follow the correct washing instructions cashmere will retain its shape better than other types of wool. Call it a polo-neck, turtleneck, or roll neck - it’s a fact that the roll-neck sweater is this season’s must-have addition to any man’s wardrobe. Rakish bohemians would never be seen dead in a shirt and tie at a formal event. True sartorialists know that the slim-cut roll-neck can be worn instead of more traditional neck attire, and The Tailor Retailored, BOLAN sweater will take you from back tie dinner to after-party in the stir of a Martini! Polo neck sweaters have historically acted as substitutes for the traditional collar and tie. From the late 19th century polo neck sweaters were worn by sailors and athletes, the name is thought to originate from a similar necked jersey worn by polo players. Since the middle of the 20th century black polo necks have been associated with philosophers, musicians, poets and glamorous cinema actors Marcello Mastroianni , Yves Montand and Alain Delon. A polo necked sweater is masculine in its elegant simplicity. It moves with the body, accentuates the face and elongates the figure. The Economist had an excellent summary of what to look for when you’re buying cashmere. In the past 15 years, cashmere has become a mass-market product. Previously, only the best fibres were taken from goats, and those fibres were milled and woven by artisans in places like Scotland and Italy. Today, standards can be much lower, and garments are often milled, mass knitted and finished in China. Today, there are no such standards, at least for mass-market product. Here’s how you should differentiate between the good stuff (which lasts a lifetime) and the cheap stuff (which can pill in a matter of weeks): "Look for tension in the knitting: stretch a section and it should ping back into shape. Hold it up to the light and you shouldn’t see much sky: paradoxically, the best cashmere, though made from the finest hair, has a density to it. Examine its surface: fluffiness suggests the yarn was spun from shorter, weaker fibres and will pill. Be sceptical about softness, too. 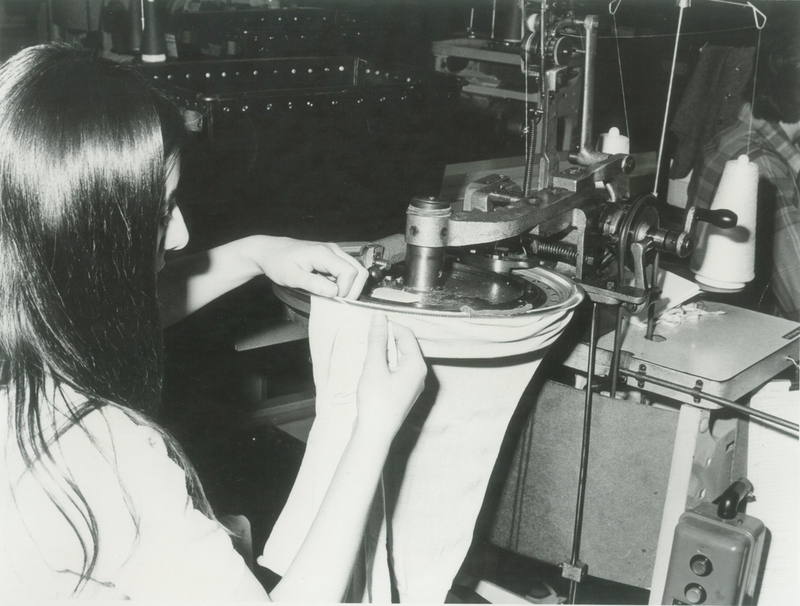 Over-milling can make a garment too soft and silky, and therefore prone to bobbling and losing its shape. More expensive cashmere may initially be harder to handle but will ease up with wear and hand-washing. The best cashmere actually improves with age.. "
At the Tailor Retailored we have embraced original traditions and our cashmere is made from only the longest, finest fibres from the goat’s underside. The yarn is milled, spun and dyed, then knitted and hand finished by artisans here in the Scotland. We have taken these old traditions and applied them to the style needs of today's discerning man, we design and make limited edition, very short run cashmere knitwear which while on trend has true style eternity. Our sweaters are knitted to fit you exactly. A tailor retailored sweater is expensive they need to be, they take a long time to create from goat to gent, and you will have them a very long time, they should become part of your life, like a wise man or a good wine they will just get better with age. This Ski season, The Tailor Retailored is recalling old school Alpine glamour and relaxed masculinity. 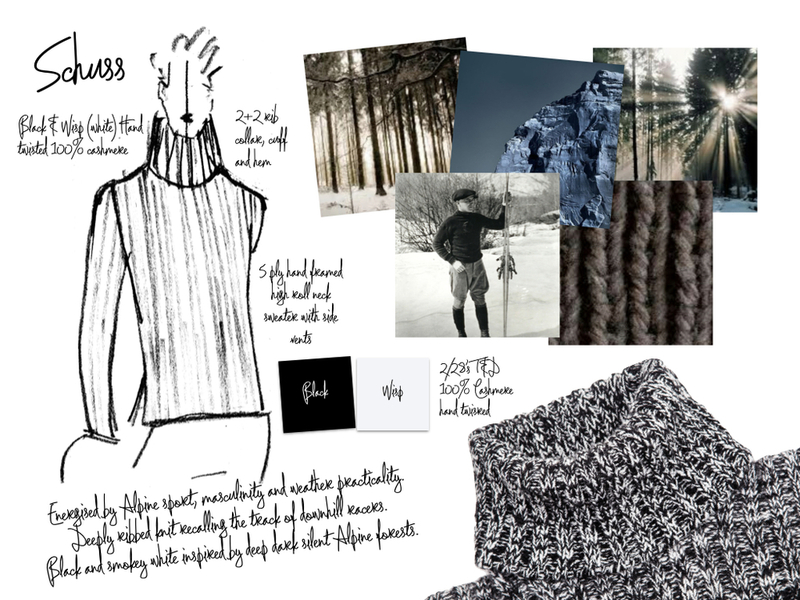 The 2+2 rib hand-framed Schuss sweater in pitch peat Black and smokey Wisp white cuts up the piste in luxurious 5ply cashmere. The lean ribbed body, high roll neck, side vents, square set sleeves is crafted by artisans in The Tailor Retailored's Scottish workroom in a limited edition of just 30 sweaters. Richard Olive, Creative Director at The Tailor Retailored said. “The Schuss is the perfect ski trip sweater, designed to provide a modern sartorial solution for layering up under jackets and propping up the bar après-ski!”. The story behind NEODANDY sweater, A jacquard inspired by 14th century Moorish decorative arts, intricate wall and floor mosaics, The NEODANDY from The Tailor Retailored is a triple ply three coloured jacquard sweater vest expertly crafted in our Scottish workroom. It is constructed from the finest 100% cashmere yarn and exists as a limited edition of thirty garments in Bourgogne red, Furnace orange and dark brown.